This stunning Coachman Pastiche Platinum 520-4 is a beautiful example of Coachman's top of the range, 4 berth caravan with a spacious lounge, well-appointed kitchen and large end bathroom, on a single axle. Featuring the highest equipment spec available from Coachman, this one-careful owner 2013 model has been extremely well looked after, having been used only very occasionally since new and still has a 'new caravan' appearance and smell. 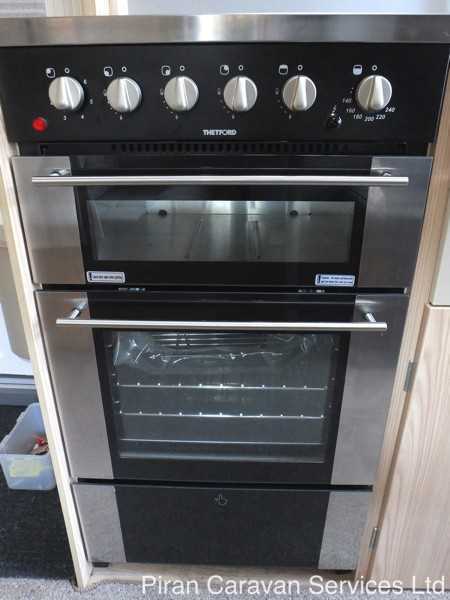 It comes with a full stamped service history and will be flying through this year's service and damp check and now benefits from recent new tyres. 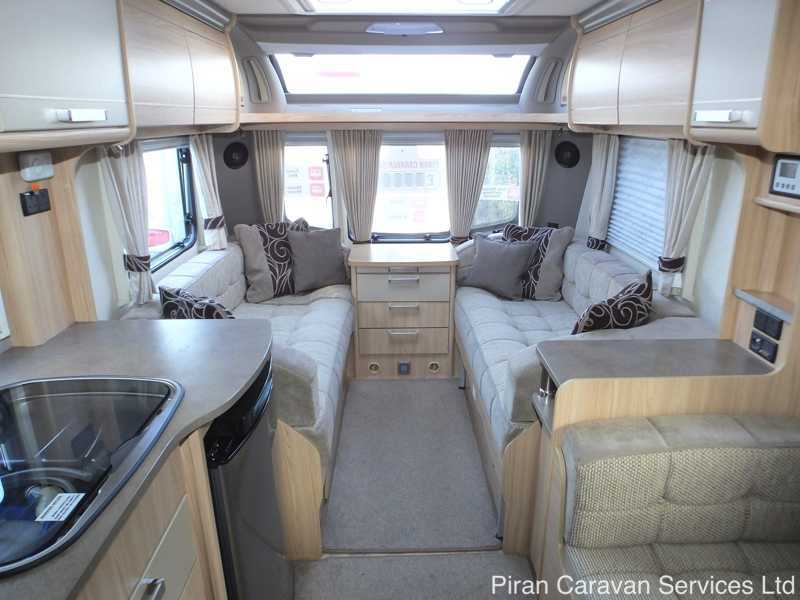 The Coachman Pastiche has been owned by a non-smoker with no pets and comes complete with all the manuals, documents and CRiS registration. 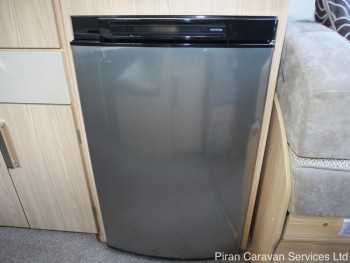 At first glance, it is plain to see that it has been loved and exceptionally well-maintained. 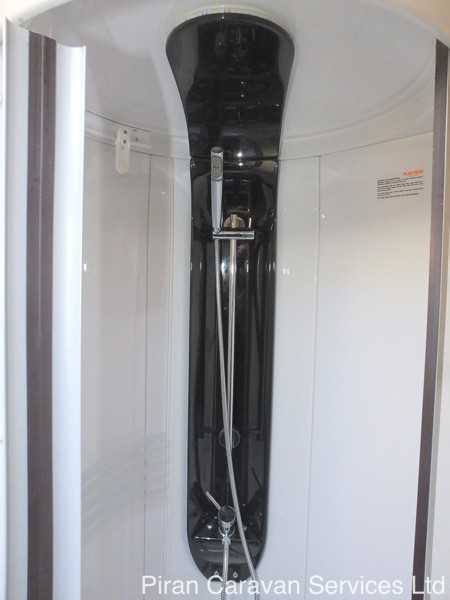 The shower and toilet are unused. The Pastiche 520 Platinum has been dealer-fitted with a remote motor mover, making siting this caravan on driveways or pitches a piece of cake. 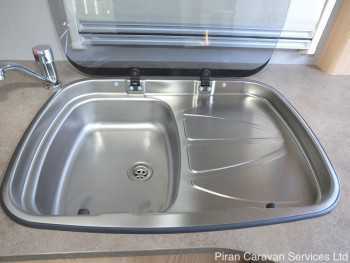 It also comes with a Bulldog Wheelclamp as well as most of the caravanning accessories required to start holidaying in this caravan, including Alko hitch lock, SAS wheel clamp, Aquaroll, Wastemaster, gas bottle and hook up cables as well as wheel chocks, a rotary drier, 2 water pumps and more. 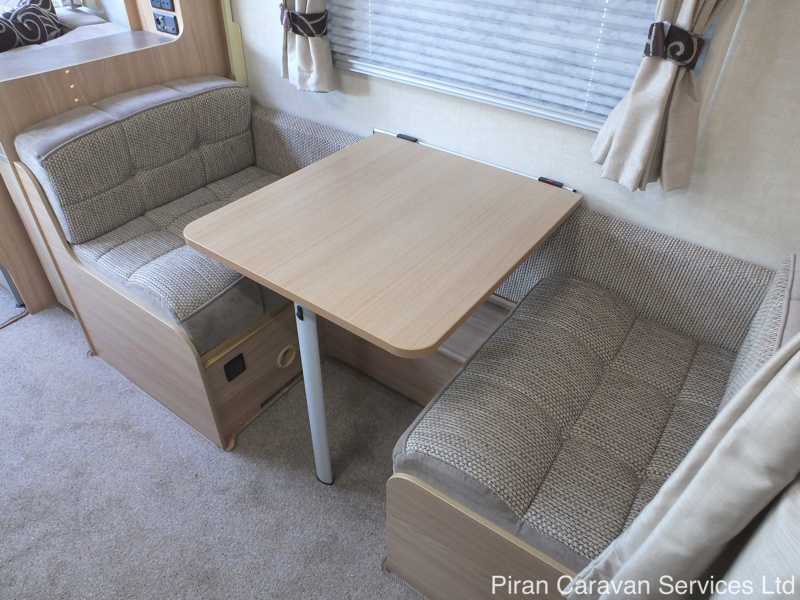 The size and living space make it perfect for a couple wanting a top of the range compact tourer for easy caravanning in the U.K. or abroad. Known for their attention to detail and commitment to quality and craftsmanship, Coachman’s description of the 2013 Pastiche, “the ultimate in comfort and quality” was embodied in this model which Coachman promised would offer “home from home comfort….featuring every luxury you can imagine”. 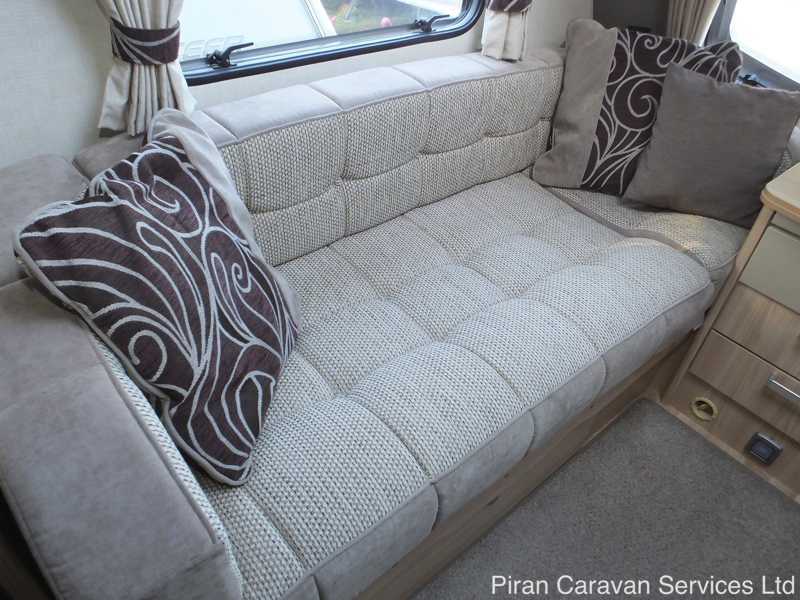 The Pastiche 520 Platinum was designed to be a 4 berth tourer which doesn’t compromise on space, equipment or luxury. 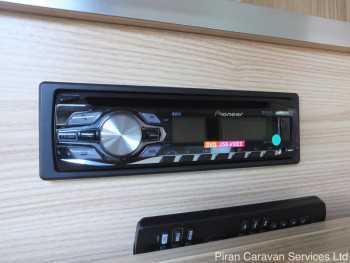 Externally, upgrades such as the ultra-modern automotive styled bodyshell, AL-KO secure wheel locks, awning warmer and AL-KO ATC Trailer Control indicate that this caravan doesn’t skimp on equipment. 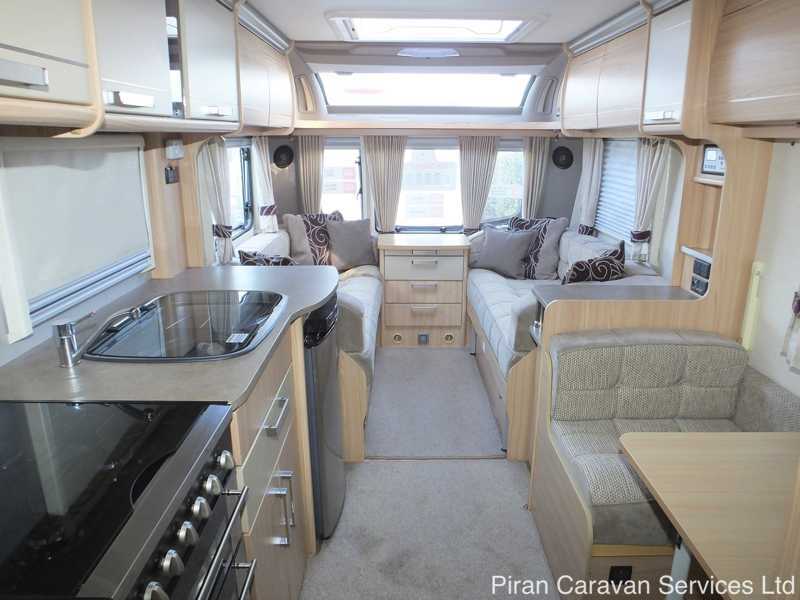 Thicker grade aluminium sides finished in gloss polar white are set off by attractive graphite and silver decals as well as Vortex graphite alloy wheels, ensuring that the Pastiche has a commanding presence when either towed on the road or when pitched on a site. Acrylic capped full height ABS front and rear panels, 45mm thick floor, laminated roof and grade 3 thermal insulation ensures that this is a caravan which is easy to keep looking beautiful, whilst remaining warm inside, even in the depths of winter. 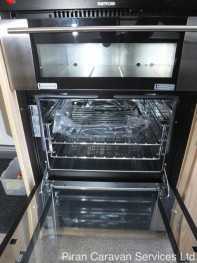 Inside the top of the range Pastiche, the combination of luxury, comfort and quality of fixtures and fittings is readily apparent. At the front of the Pastiche, the lounge has deep comfortable sofas and is perfect for relaxing or enjoying a meal with family or friends using the dining table provided. It has two single beds or a large double utilising a pull out deck that is beneath the off side seat. 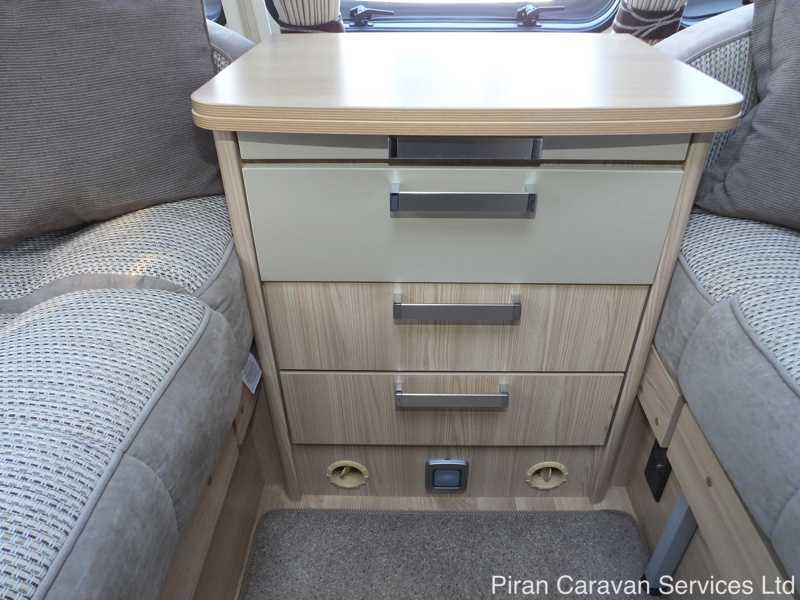 There is also a chest of drawers with a small ‘pull out’ table, and if a larger table is required there is a 'fold out' dining table which has it's own storage within its own cupboard next to the wardrobe in the bathroom. 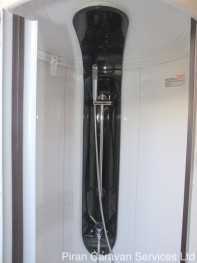 There is plenty of storage in the overhead aircraft style lockers, which are finished in 'Contemporary Ash' Italian design wood with metallic trim, and also under the seats. 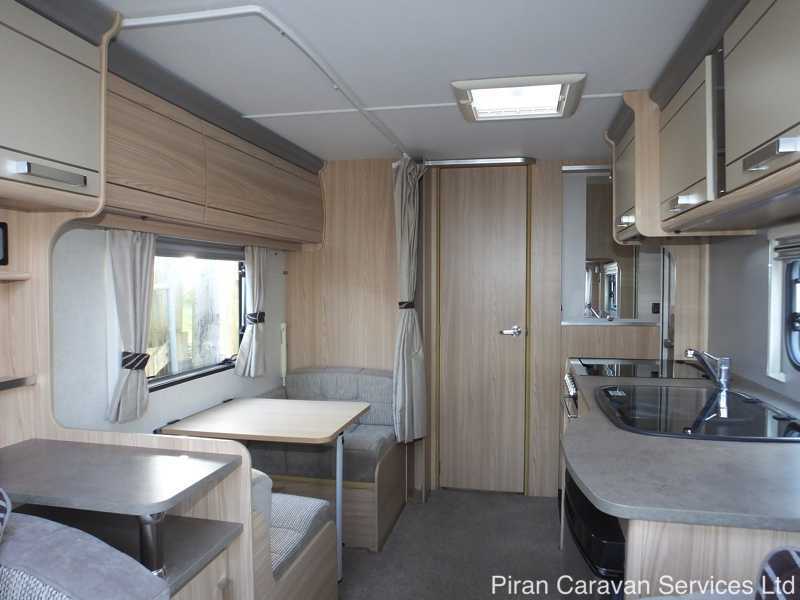 3 double glazed, poly plastic windows combine with the large Heki 2 panoramic roof light to create an airy and light feel to the living area. 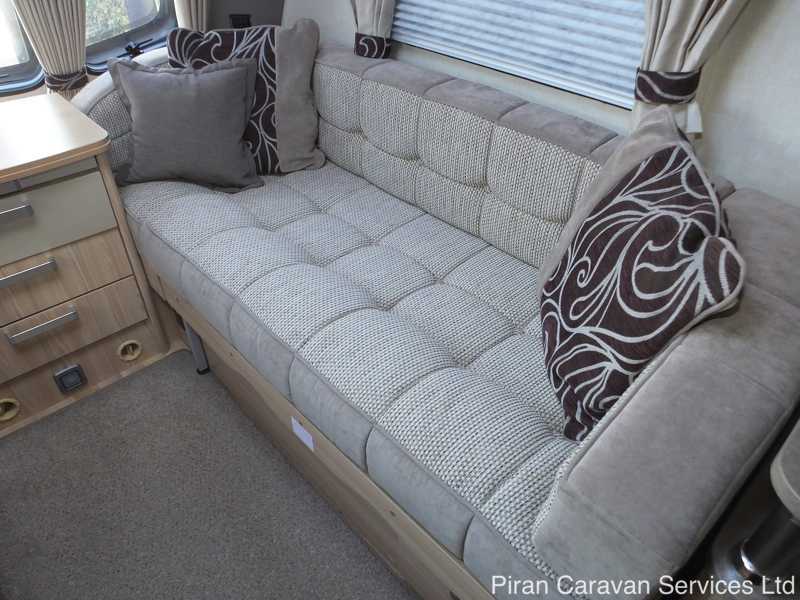 The upholstery is finished in luxury neutral design fabric and is complemented by matching scatter cushions and curtains. 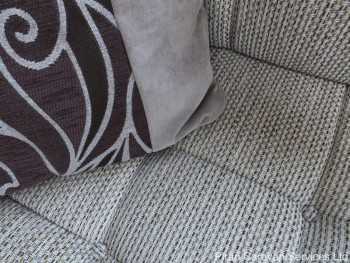 The loose-fit carpets are laid over a luxurious floor covering. 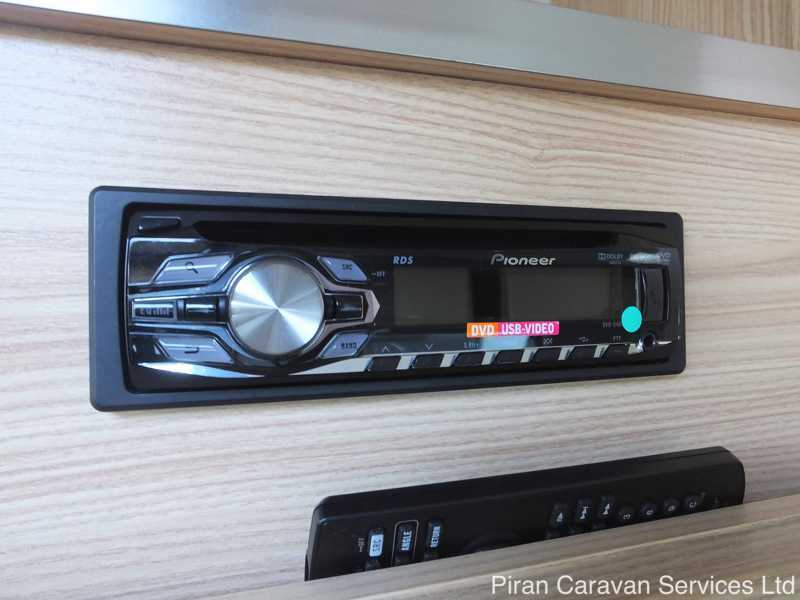 Discreetly fitted within one of the overhead lockers is the Pioneer entertainment system with remote control, radio, CD, MP3 player, ipod connectivity. 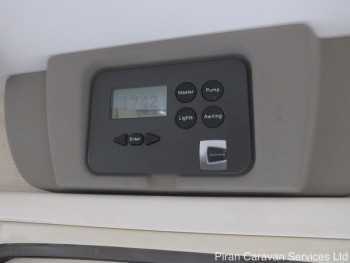 The windows, roof lights and door all come with fly screen and blackout blinds and the side and rear windows are flush fitting Seitz cassette units. 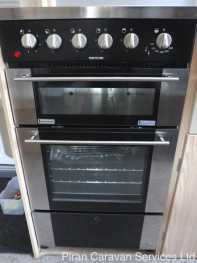 Moving back through the Pastiche, there is a well-appointed kitchen with 3 way 113 litre Thetford 3000 Series fridge with freezer compartment and auto energy search and a Thetford Aspire oven, separate grill, and 4 ring hob -three gas burners and one electric ring with electric ignition and flame failure device. 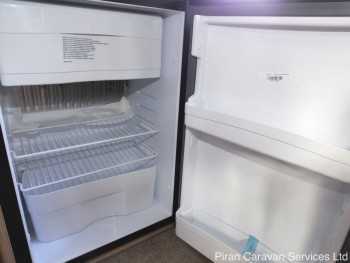 The built-in microwave oven is set at eye level and there is ample food and utensil storage. 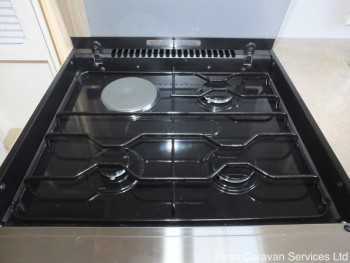 A 3 speed, 2 way Omnivent extractor roof light is situated above the cooker to ventilate the kitchen area when cooking. 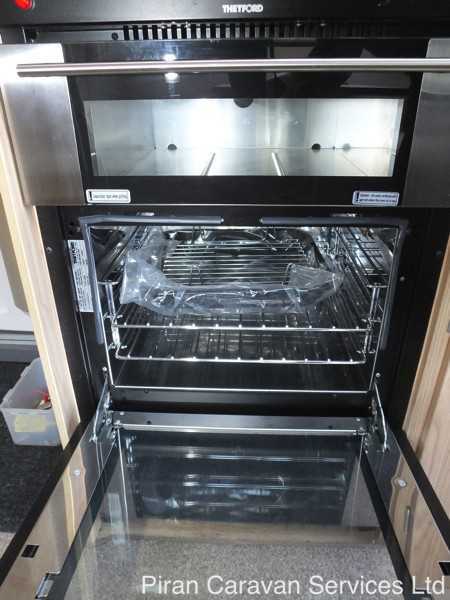 The kitchen has plenty of worktop space for food preparation and storage for food and other kitchen essentials. 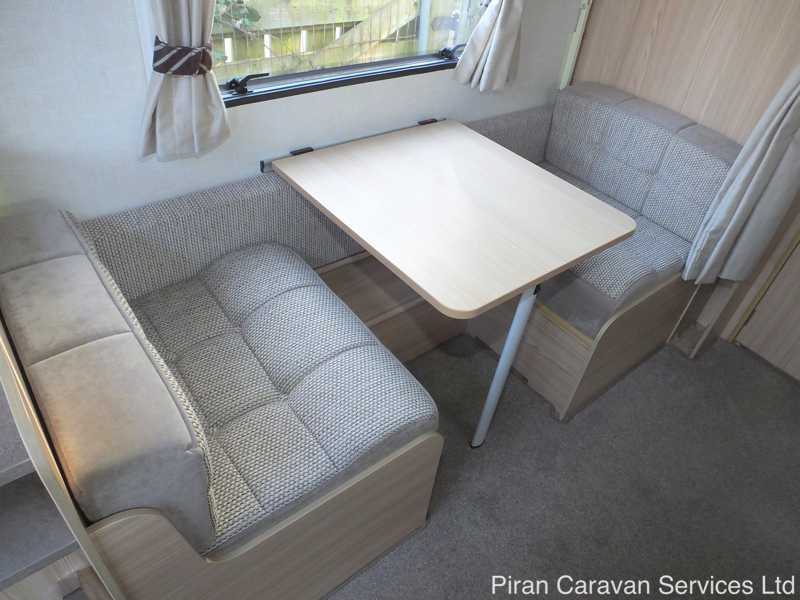 Opposite the kitchen, a side dinette provides additional dining space during the day and at night, converts into a set of two bunks which can be separated from the rest of the caravan by a curtain. The cushions for the top bunk are still in their plastic packaging! This gives the Pastiche lots of general living space and adds to the practicality of the layout. 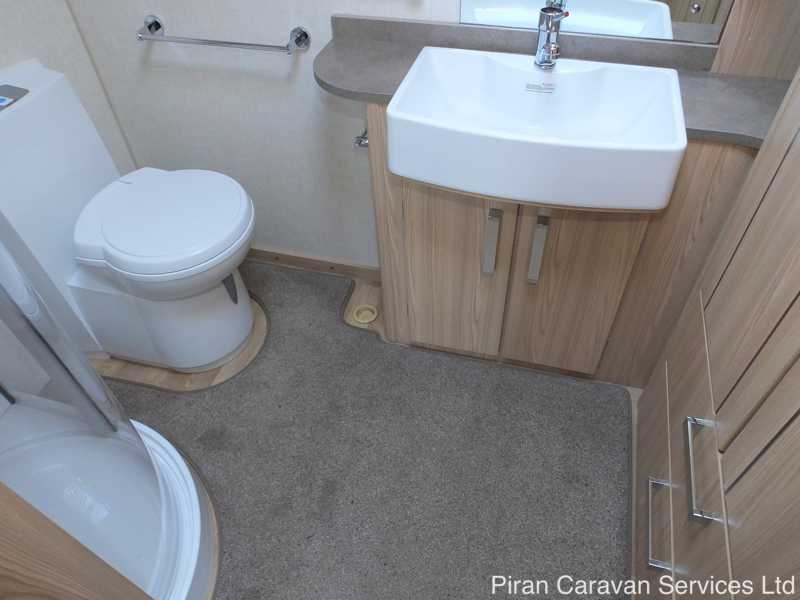 This high spec compact tourer's main distinguishing feature is a spacious end bathroom at the very rear, which features a domestic style door and handle, a large fully lined ABS circular shower cubicle with 'Ecocamel' shower head, chrome bathroom fittings, an LED shower light, a Thetford c-260 swivelling toilet with electric flush, as well as a 'Belfast sink' wash-basin, vanity unit, mirror, large wardrobe with automatic interior light and ample storage. There is plenty of room for privacy when changing in this washroom. 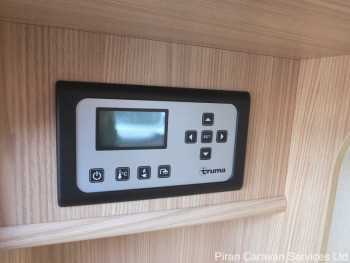 Heating is taken care of by the Truma programmable radiator heating system with combined water heating, which like a domestic system, gives complete control over the temperature inside the caravan, even allowing for the heating to come on and warm the caravan before you return from a day at the beach! 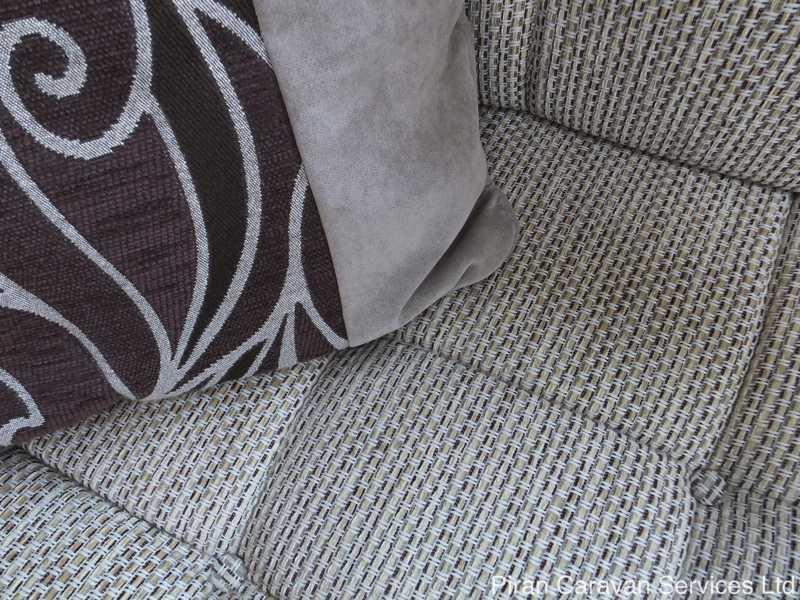 When combined with the grade 3 thermal insulation, this means the Pastiche can be used in complete comfort, year-round. 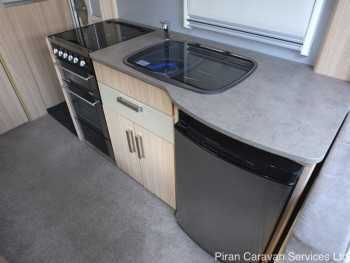 Additional equipment on the Coachman Pastiche includes a large front locker, LED awning and service lights, external Gas BBQ socket, external 240V socket, heavy duty corner steadies fitted with heavy duty jack pads, steel spare wheel (in Al-ko underslung carrier) and Al-Ko chassis with 3004 stabiliser. There is a 13 pin DIN standard socket to connect to the car towing electrics. 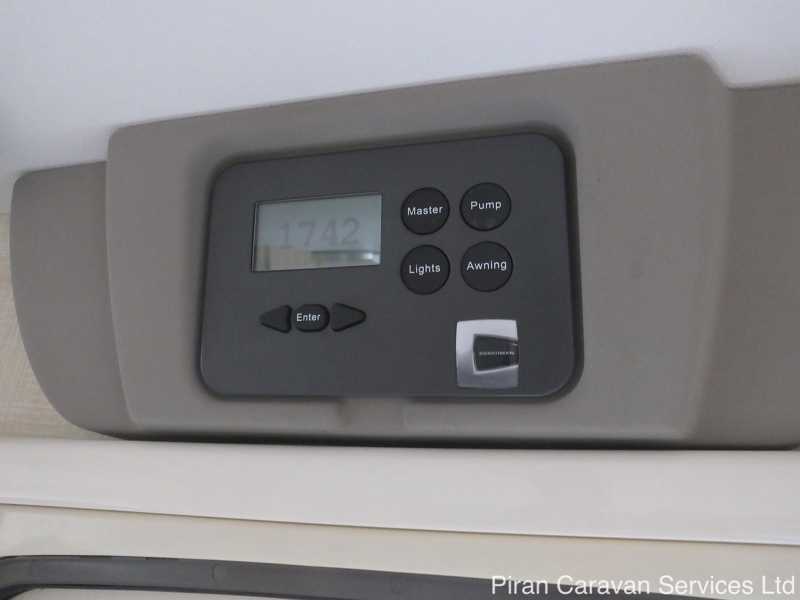 On the roof of the caravan is a Status 530 directional aerial to ensure you pick up a good signal wherever you are. The exterior also features an awning heater, external TV aerial and satellite sockets and provision for the addition of an external Solar panel. As previously mentioned, the Pastiche comes with a dealer-fitted remote motor mover making it easy to manoeuvre and site on tricky pitches. 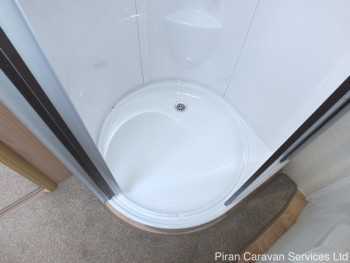 This sale includes most of the extras that you will require for your caravanning holiday including a Bulldog wheel clamp, Wastemaster, Aquaroll. 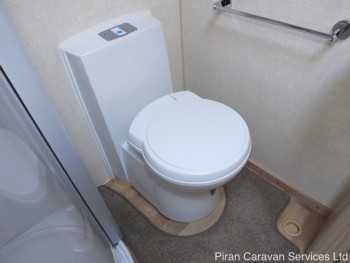 hook up cable, caravan step and more. 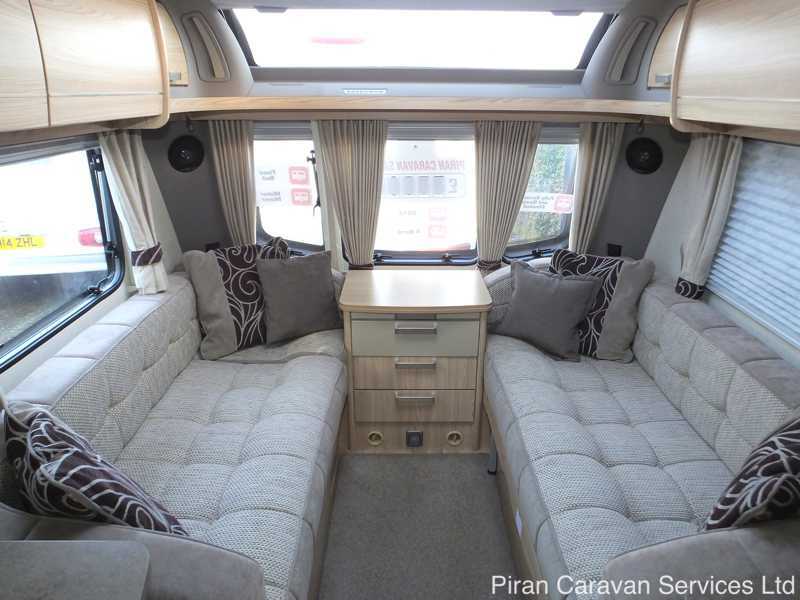 In summary, this luxurious 4 berth Coachman Pastiche Platinum 520-4 is as close to 'as new' as it is possible to get for a 2013 caravan. 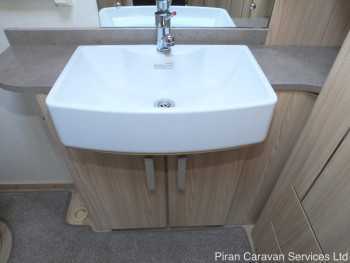 It is ideal for a couple or family with small children, looking for a very high spec caravan in the best possible condition, with a layout featuring a large bathroom and lots of living space. 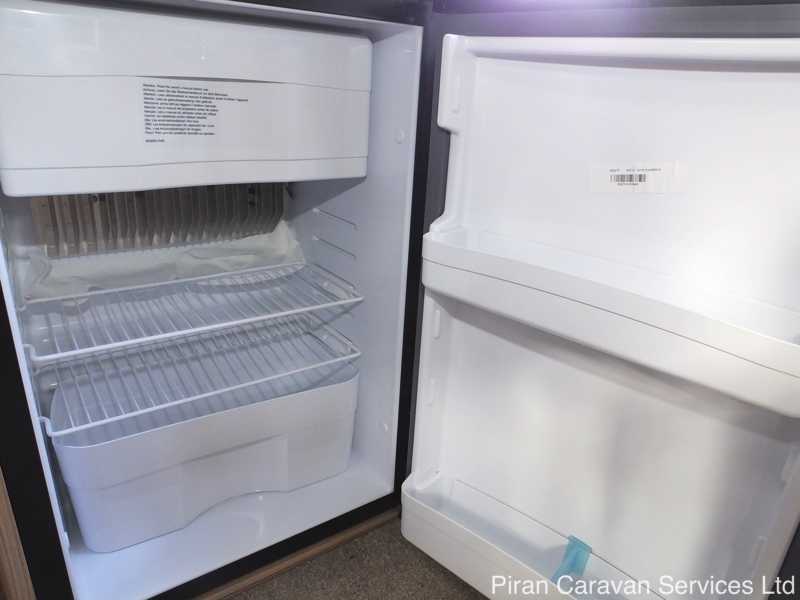 All the extras make this Coachman Pastiche exceptional value for money. It will have been fully valeted inside and out, and will be fully serviced and damp-checked ready for its next adventure. This caravan has the option of a place within our CaSSOA Gold storage facility (the facility presently has no other vacancies and has a long waiting list).